Eaton’s Tyler Gregory looks for running room during the Eagles game with visiting Brookville on Friday, Sept. 14. Eaton suffered a 48-13 setback to fall to 0-4 on the season. 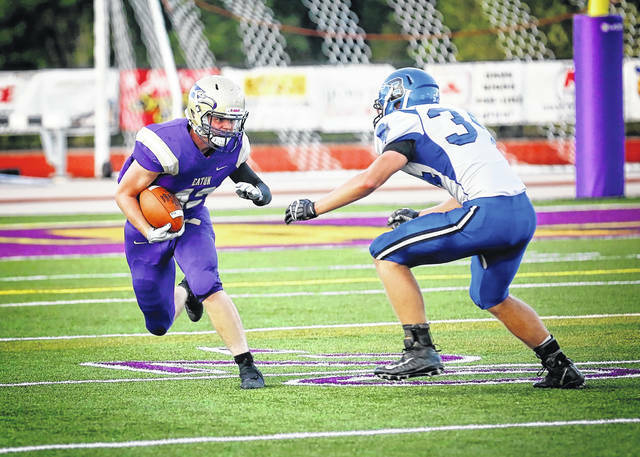 PREBLE COUNTY — Eaton’s football team opened league play with a 48-13 loss to visiting Brookville on Friday, Sept. 14. The Eagles, who fell behind 20-0 at halftime, allowed the Blue Devils to rush for 423 yards. Eaton scored both of its touchdowns in the third quarter as it trimmed the Blue Devils lead to 27-13. Junior Zac Schmidt scored on a 6-yard run and caught a 19-yard pass from quarterback Dawson Blaylock for the second score. Schmidt’s first score made it 20-7 and the second made it 27-13 with 2:12 left in the third quarter. Brookville, though, put the game out of reach with 21 unanswered points in the fourth quarter. The Blue Devils scored on runs of 1, 12 and 44 yards in the final quarter. Blaylock finished the game with 149 yards passing, completing 9-of-19 passes. Caleb Puckett rushed 16 times for 136 yards. Eaton, now 0-4 overall and 0-1 in the SWBL, will travel to Oakwood on Friday, Sept. 21. Preble Shawnee had trouble with defending SWBL Buckeye Division champion and state semi-finalist Madison on Friday, falling 48-14, at home. The Mohawks led 22-0 after the first quarter and 42-0 at the half. Ben Hobbs put Shawnee on the board with a 16-yard TD run in the third quarter. He added a 2-yard TD run in the fourth. The Arrows managed just 109 yards of total offense. Hobbs had 39 yards rushing on 15 carries and James Gibson had 10 carries for 36 yards. Shawnee (1-3, 0-1 SWBL) is scheduled to travel to Waynesville on Friday. Tri-County North’s football team suffered a 45-8 loss at Covington on Friday. With the loss, the Panthers fell to 2-2 overall and 1-1 in the Cross County Conference. North fell behind early as the result of a safety and never recovered. The Panthers trailed 11-0 after the first quarter and was down 38-0 at the half. North finally reached the end zone with Tristen Hayslett scoring on a 72-yard TD pass from quaterback Brian Stinson in the fourth quarter. The Panthers return home on Friday to host Bradford. 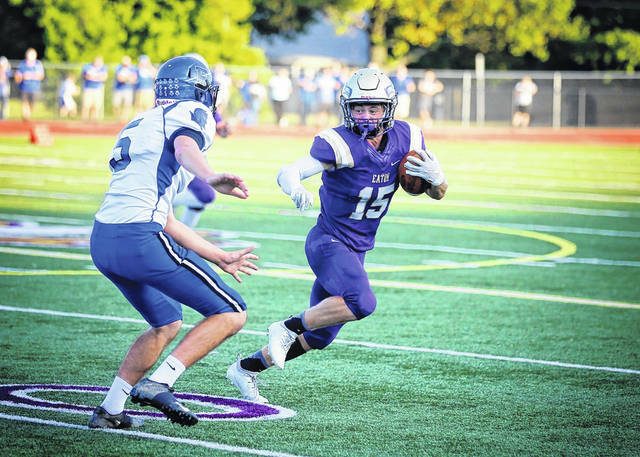 https://www.registerherald.com/wp-content/uploads/sites/41/2018/09/web1_EATON-FB-1.jpgEaton’s Tyler Gregory looks for running room during the Eagles game with visiting Brookville on Friday, Sept. 14. Eaton suffered a 48-13 setback to fall to 0-4 on the season.